Discover why you need to pay for your volunteer work and why the fees vary among different social projects. The social projects on Volunteer World are usually Non-Profit Organisations (NPO). Thus, they hardly earn enough money to cover their costs. This is also the main reason, why they need your help. They cannot afford to bear all the costs by themselves. This is why they depend on donations and on the volunteer's fees. Fees for the volunteers arise because a volunteer program causes expenses for the social project that runs the program. What expenses does a social project have? The social project is coordinating, organizing and processing your stay. Therefore they need to have a proper administration office. Furthermore, they help and guide you once you are on site. In exchange, many of the projects provide accommodation, food, drink, and airport pickup. All these expenses need to be covered. These expenses emerge in order to run the social project and can include office-items, salaries of local staff, insurances, trainings, telecommunication, office rent, transportation etc. Therefore, fees can vary. However, all these fees can be associated directly with the social project. The fees help the social project to operate and to improve their community. We make sure that our social projects state their social impact so that you know what the local contribution of this project is. Social projects need help with IT, Business Administration and Fund Raising, as well. Volunteer World helps them to improve their IT infrastructure by offering them an easy-to-use platform. But overall, your time and your financial contribution is the key to make their social impact work! E.g. an elephant conservation program needs to feed its animals or a marine conservation program needs to provide diving equipment for the volunteers. Why do the fees vary? Not all social projects are operating in the same way. Some are non-profit, some are profit organizations and others are supported by the government, so-called governmental organizations. The difference of the fees depends on what the organization offers. Have a close look at what the social project charges for. You can also ask the social project itself, what the fees are charged for. The average weekly fees are calculated from the costs of the volunteer program. Weekly fees can vary depending on the length of your stay. Sometimes the weekly fees decrease over time as there are no initial fees anymore. 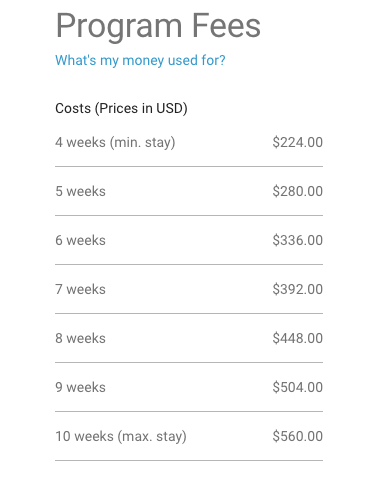 In other words, the longer you stay at the program site, the cheaper the fees. 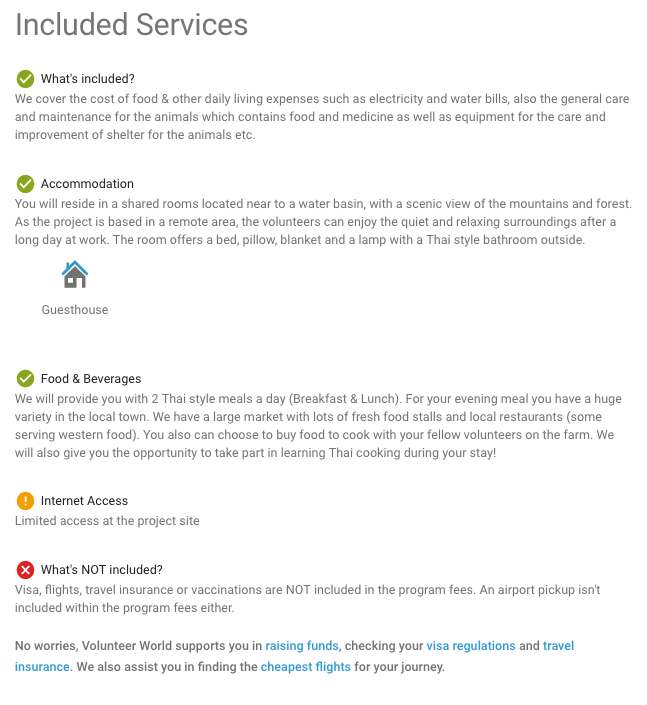 Below you can see an example of a volunteer program's fees.